I chose and arranged the music and laid out how the monologue would tell the story of Hoagy's life and times through the songs. I found another writer to help me with the script and in 1979 we copyrighted our work. It took me 8 years to get the rights to all the music and the use of his persona onstage. In 1987 Hoagy opened at the Zephyr Theatre in San Francisco (now the New Conservatory Theatre Center). We got good reviews (click Press Reviews on the menu to your left) and ran for 13 weeks. The cast included a female singer, Ms. Baomi Butts-Bhanji, and 3 other musicians--trumpet, clarinet/sax and bass. In 1990 I was invited to do a smaller version of the piece--just me and a female singer--at Milwaukee Repertory Theatre's Stackner Cabaret. This gave me my Equity card but I missed those horns. I wanted to go bigger, not smaller. Reviews from this production are on the same link to your left. Of course we wanted to bring the show into New York or LA or Chicago. We had some nibbles but we also had serious obstacles put in our way by the Carmichael Estate, which has been trying to produce its own show for many years. They've had some scripts produced but have never mounted a production. I have done my show in three different cities. 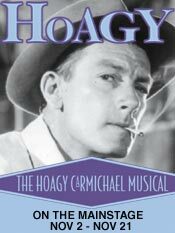 At once a loving tribute and a grand entertainment, Hoagy is a jazzy and sensual celebration of Hoagy Carmichael, one of the greatest American songwriters that ever lived and a true legend of popular music. His classic songs are countless, including "Georgia On My Mind," "Rockin' Chair," "Lazy River," "In the Cool, Cool, Cool of the Evening," "Skylark," "Heart and Soul," and perhaps most memorably, 'Stardust,' the most recorded song of this century. Hoagy shines the spotlight on these and many more memorable songs. And in the tradition of Jolson and Company, Hoagy chronicles the life and times of its title character, with a singer/actor giving a tour de force performance as Hoagy Carmichael, supported by another singer, dancers, and an on-stage band.